The Lustron house was a prefabricated enameled steel house made in Columbus, Ohio, between 1948 and 1950. The design was an attempt to repurpose factories left from the war effort and to address the post-war housing crisis. Approximately 2000 were made. 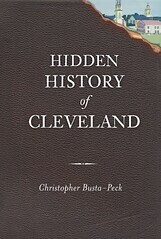 Many were built in the Cleveland area. All of the major component parts were made from steel - including the roof. Sadly, most have not held up as well as this model, at 695 McKinley Avenue, in Bedford, Ohio. Even it, however, has recently had replacement windows installed. This house, documented by the Historic American Buildings Survey, provides some idea as to the original appearance of the interior. The rooms featured built in closets and cabinets, which provided greater use of the available floorspace. Four choices of exterior colors were available: blue, yellow, tan, and gray. Due to changing tastes, more than half of the Lustron houses in this area have since been vinyl-sided, such as this one, at 1517 Crestwood Road, in Mayfield Heights, Ohio. It seems likely that this is more the result of changes in taste than anything else - I have not seen one bit of rust on any of these houses, and if rust was such a problem that some owners vinyl-sided their houses to conceal it, it would surely show up to some extent those not vinyl-sided. The roof, too, has been covered with asphalt shingles. It is not clear whether this was done to remedy a problem or due to changes in taste. It seems that a greater percentage of these houses have new roofs than have vinyl siding. Many of the interiors have remained the same, as the steel structure makes them difficult to change. This one, however, at 1024 Mayfield Ridge Road, in Mayfield Heights, Ohio, has changed quite a bit. It is currently listed for sale by owner. The listing provides a detailed view of the interior. These houses represent a significant point in our industrial growth and movement to the suburbs. 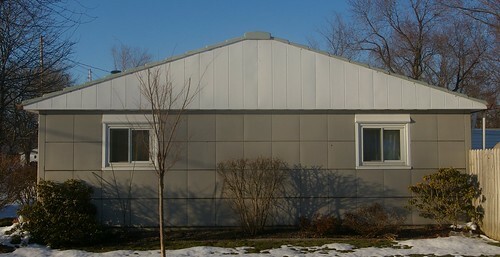 The first enamel-steel house was built in South Euclid, by Ferro Corp. Later work in this field was based on that house. Should we try to preserve all of these houses? No. We should work to preserve the best examples. One example would be this one, on Mastick Road in North Olmsted. It retains most of the original exterior details and looks quite sharp. Further, we should identify all of the extant Lustron houses, so that if one is to be demolished, some of the parts, which are quite difficult to find, may be reused in other Lustron homes. Lustron Preservation has a database mapping all the known Lustrons, which provides a great deal of assistance, to that end. We have five Lustrons here in Greensboro, NC all of which are still in the original condition (exterior-wise). They are still in good shape probably due to our mild winters. There is one here on the street that I live on which is a rental, but I understand it still has the original enameled interior and radiant heating panels, and that weird dishwasher-clotheswasher combination. Can you imagine shipping those down from Columbus on flatbed trucks here to Greensboro in the time when there were no interstates? They has to come down through West Virginia and Virginia on two lane mountain roads. And not just one, but seven total? We lost two of these in the 60's when they were demolished to build stick-built homes on the lots. It's crazy. I know that they wanted to ship the Lustrons by rail, but were unable to arrange that, due to insufficient volume. Personally, I can't say that I'd want to live in one, due to their variety of quirks, but I still love the aesthetic. If I'd bought the farmhouse with too much land out in the country, I would have loved to have one of them, especially a smaller one, as a guest house. The Lustron capital is Lombard, Illinois, a western suburb of Chicago. Dozens were built and many survive, mostly intact. There was a Lustron in my current hometown of Glen Ellyn, Illinois. I went to an estate sale at the house just before it was torn down. The interior walls were the same steel as the exterior, with pictures hung on the walls by magnets. Kind of like living in a tin can, I would guess, but a noteworthy experiment at mass production housing. Thanks for your feature on Lustrons! FYI, there's an active community of Lustron owners (myself included) who've been participating in online discussion via a Yahoogroup list for 10+ years. Recently, the NTHP sponsored the creation of a special website for restoration best practices, etc. at lustronpreservation.org. Tom Fetters "wrote the book" on Lustrons a few years back (and generated the first attempt at a state-by-state inventory, which continues to this day in a couple of interations). And don't miss the movie (see lustron.org)! Luckily, it seems that the current economic sitation has slowed the frequency of Lustron tear-downs (usually replaced by some monstrosity), but we've struggled for years about how to organize some sort of dedicated parts salvage system. Problem is, we often don't hear about a tear-down until just before it happens. And even if there's some lead time, there are often difficult liability issues re access & salvage. Plus, while most Lustron owners do love their Lustrons, there's not necessarily as much demand for replacement parts as you'd think: alot of folks are perfectly happy to live with their altered Lustrons -- besides, many of these have been irreversibly changed in some way. There have been a couple of successful salvage operations for a handful of parts (pocket doors, cabinets, etc.) for re-use, but these tend to be very informal, hit-or-miss opportunities. I myself am somewhat of a Lustron purist, but I've learned to tread delicately re trying to convince people about Lustron restoration. The best we can do is to put good info out there, get Lustrons on the local history/preservation radar, and encourage sellers to market them in such a way as to attract sympathetic buyers who will appreciate & embrace the home's historic significance.